​You’ve filed your taxes (or you’re planning to very soon) and you’re expecting an income tax refund. To some, this perceived windfall can be a sign to go on a spending binge. According to Canada Revenue Agency, the average income tax refund for the 2018 tax year to date is $1,735 – about the cost of an all-inclusive vacation for one in the sunny south, a few nice dinners out, or a very decent shopping spree. If you’re getting an income tax return, that means you’ve overpaid taxes and you’re simply getting some of that back. Stop treating your tax refund as “extra” cash. 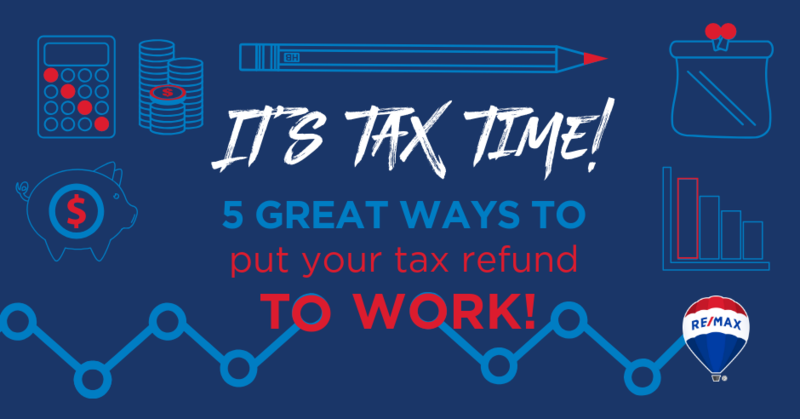 Here are some smart ways to put that tax refund to work. It’s unlikely that you’ll miss this chunk of money, since you’ve technically already paid your taxes and are just getting some of that back. Use it to pay off some debt and reduce the interest you’re paying on that loan. Less interest paid means more money in the bank for your living expenses. ​Leaving that cash in a savings or chequing account makes it easy to access – and spend. Take advantage of tax savings in 2019 by depositing your 2018 refund into your Registered Retirement Savings Plan or a Tax-Free Savings Account. While your tax refund may not be enough to fund a full-blown renovation, the average refund is definitely enough to cover some upgrades in your home. This can boost your return if you’re planning to sell this spring. If you’re planning to stay in the home, you’ll enjoy the added liveability – and some shiny new faucets! ​If home ownership is part of your future plan, deposit your tax refund into a “down payment” fund. An RRSP is a great option. You’ll enjoy a tax break, and you can borrow up to $25,000 (tax-free!) for your down payment and other home purchase-related costs when you’re ready to buy. 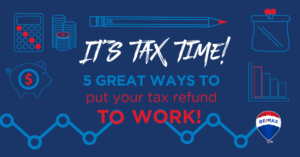 Don’t forget… Income tax and benefit returns are due by April 30, 2019!